Connacht cannot afford to let slip an opportunity to maintain momentum and widen the gap between themelves and Zebre when the sides meet at the Sportsground this evening (7.35pm ). Last weekend's win over the Ospreys put some distance between Kieran Keane's charges and the chasing Swansea and Italian outfits, but more importantly it keeps the pressure on fourth-placed Cardiff, who are a single point in front. Connacht will not be back at the Sportsground for a month, and it is crucial both the Connacht faithful and the squad leave the College Road venue tomorrow evening in a good place as they continue to have their sights on the visit of Gloucester at Easter. Before then, however, Connacht face a tough two weeks on the road, firstly against a firing Treviso in Italy, and then a first visit to the high altitude of South Africa's Bloemfontein, and they will be difficult assignments in their bid for Champions Cup qualification. Firstly they need to avenge their 24-10 defeat to Zebre in December, which was one of Connacht's poorest displays, says defence coach Peter Wilkins. "We knew it would be a challenge going over there [in December], but we felt that day we didn't deliver. We played without the bounce, energy, and enthusiasm we display on our good days. It wasn't through lack of a focus, concentration or respect for Zebre, we just didn't deliver. "They were hungrier and sharper and we need to put it right. We have that opportrunity here at the Sportsground this week, and everyone is motivated." The fixture will mark Finlay Bealham's 100th game for the province - a special achievement for the 26-year-old Australian born prop who has blossomed since joining the Connacht Academy four seasons ago. Having fully recovered from a "knee niggle", Bealham will be one of few changes Connacht are expected to make when Zebre coach Michael Bradley returns to the Sportsground where he coached for seven seasons. Wilkins says the fixture is about building on the momentum of the past seven successive Sportsground wins, while keeping an eye on the two-week trip to Italy and South Africa. "We are not looking at making too many changes because it is important we maintain the success we have had at home over the last few months. We are in a good position with guys fresh after the break, and we want to go away for two weeks with as many as possible players who are match fit and fresh. It is about how we balance and reintegrate players into the squad." Two players returned to training this week, Jarrad Butler and Niyi Adeolokun, while Tiernan O'Halloran, who tweaked his hamstring last week, will miss tomorrow's fixture. Having just returned to action following a long layoff with an Achilles injury, Andrew Browne took a bang to his shoulder and will be sidelined for up to six weeks. "This week, it is all about beating Zebre, and our decision making in attack and defence will be crucial," Wilkins says. Connacht will look to take control of the game early on, and defensively will need to be disciplined against an Italian side that loves to run. On more than one occasion Connacht has been caught against this side, but if they stop the Italians from winning the collisions and getting front foot ball, they will go some way to denting their aspirations. 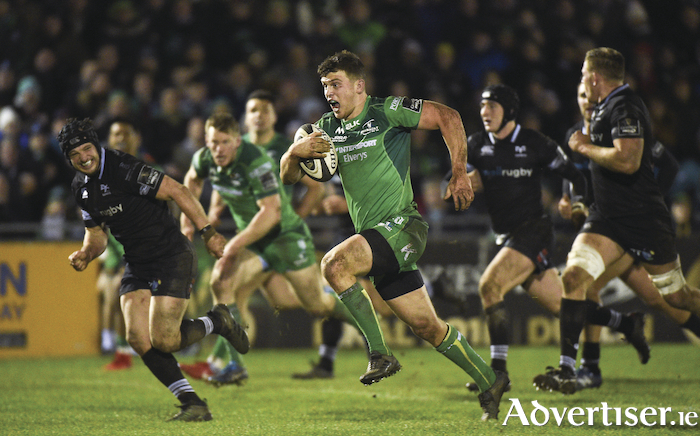 Both sides like to play at tempo which always makes for an entertaining encounter, but defence will be key, as it was last week against the Ospreys, if Connacht want to win an eighth successive win at the Sportsground. Last Saturday's important win ensured Connacht stretched their lead over Ospreys. Kieran Keane's side made full use of home advantage, and were more efficient with limited possession against an Ospreys side that dominated for long periods. However Connacht's two tries and 16 points from outhalf Craig Ronaldson were enough to put some more distance between themselves and both Ospreys and tomorrow's visitors Zebre.